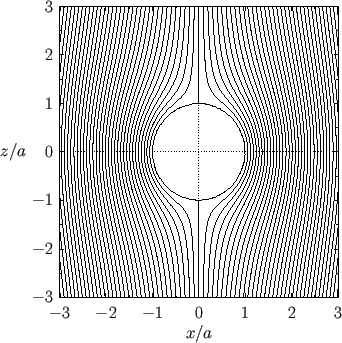 Figure: Contours of the stream function in the - plane for Stokes flow around a solid sphere. 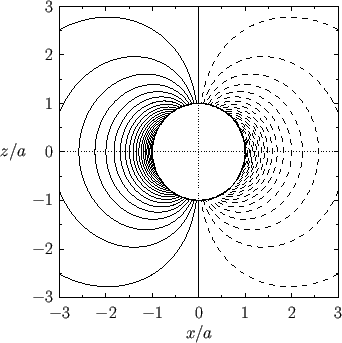 Figure: Contours of the vorticity, , in the - plane for Stokes flow around a solid sphere. Solid/dashed lines correspond to opposite signs of . 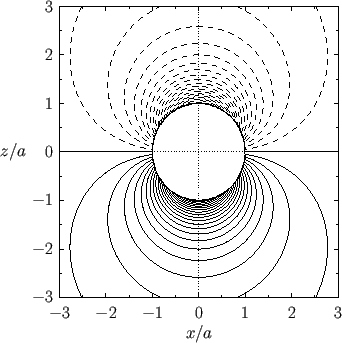 Figure: Contours of the effective pressure, , in the - plane for Stokes flow around a solid sphere. Solid/dashed lines correspond to opposite signs of . By symmetry, the horizontal components of the net force both average to zero. We can recognize the second term on the right-hand side of the previous equation as the buoyancy force due to the weight of the fluid displaced by the sphere. (See Chapter 2.) Moreover, the first term can be interpreted as the viscous drag acting on the sphere. Note that this drag acts in the opposite direction to the relative motion of the sphere with respect to the fluid, and its magnitude is directly proportional to the relative velocity. For the case of a grain of sand falling through water at , we have and (Batchelor 2000). Hence, , where is measured in meters. Thus, expression (10.129), which is strictly speaking only valid when , but which turns out to be approximately valid for all Reynolds numbers less than unity, only holds for sand grains whose radii are less than about microns. Such grains fall through water at approximately . For the case of a droplet of water falling through air at and atmospheric pressure, we have and (Batchelor 2000). Hence, , where is measured in meters. Thus, expression (10.129) only holds for water droplets whose radii are less than about microns. Such droplets fall through air at approximately . where is the Reynolds number of the flow in the immediate vicinity of the sphere. [See Equation (10.95).] Our analysis is based on the assumption that advective inertia is negligible with respect to viscosity. However, as is clear from the previous expression for the ratio of inertia to viscosity within the fluid, even if this ratio is much less than unity close to the sphere--in other words, if --it inevitably becomes much greater than unity far from the sphere: that is, for . In other words, inertia always dominates viscosity, and our Stokes flow solution therefore breaks down, at sufficiently large .